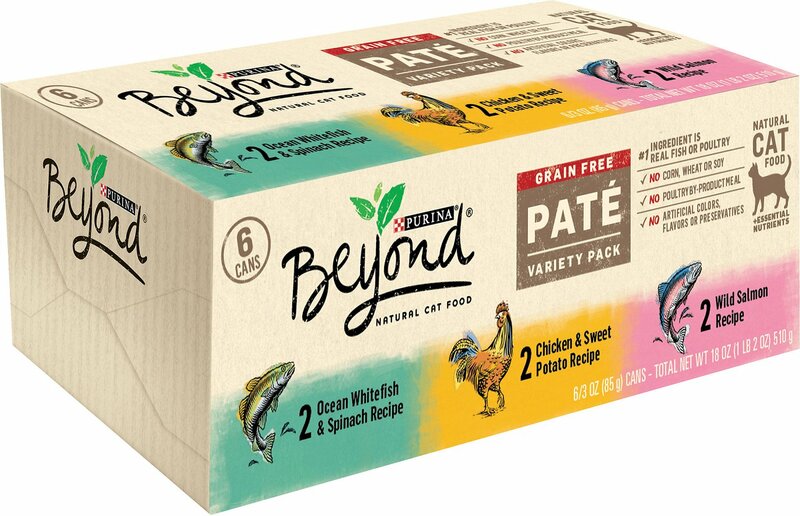 Purina Beyond Grain-Free Pate Variety Pack features pâté recipes that provide the natural nutrition plus essential nutrients your cat deserves, in the grain-free solution you're looking for. Purina thoughtfully selects natural ingredients that work together to deliver the right nutrition to help your pet live a long, healthy life. 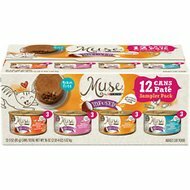 This six-count variety pack offers three varieties of grain-free pâté recipes: two cans of Grain Free Wild Salmon recipe, two cans of Grain Free Chicken & Sweet Potato recipe, and two cans of Grain Free Ocean Whitefish & Spinach recipe. Real proteins like chicken, ocean whitefish, or wild salmon are the #1 ingredients in these foods for adult cats. Vitamins and minerals are added to make them a complete and balanced meal so your cat can live a long, healthy life. There's no grains, corn, wheat or soy so it's a great option for pet parents that are concerned with allergies, obesity and digestibility. Quality proteins are used in each formula and there's no poultry by-product meal, added artificial colors, flavors, or preservatives so you can feel confident about feeding your loved one. This 6-count variety pack of pate style recipes each contain nutrient packed vegetable accents while added Taurine helps to support eyesight and heart health. Feed 1 can per 3 - 3 1/2 lbs of body weight daily. Adjust as needed. Divide into 2 or more meals. Refrigerate unused portion. Cats need protein, and they crave the flavor of real meat. Purina Beyond cat food delivers the essential nutrients your kitty needs in formulas that will have her running to the bowl each time. Made with natural ingredients, these nourishing recipes have been expertly formulated and sourced for a diet that's easy to digest and nutritionally complete. Purina Beyond's kibble line offers protein variety in both whole grain and grain-free options. Simply: Your cat can have her pick of real white meat chicken with carrots and apples, or real salmon accented with cranberries and spinach. Both are rich in nutrients, protein and amino acids. Indoor Created especially for indoor cats that have unique nutritional needs. It helps support a healthy weight, provides natural fiber to aid digestion, and has antioxidants for immune system support. Superfood Blend Nutrient-dense superfoods like salmon, pumpkin and egg help support your pet's immune system. Grain-Free For sensitive pets, these grain-free formulas keep away troublesome ingredients and instead provide essential amino acids plus quality fiber and an irresistible natural liver flavor. There's a hearty wet food to suit every kitty, from the basic proteins to extravagant tastes. Most are grain-free, with several enticing whole grain options, too. Pâté lovers and cats who prefer a meal covered in gravy will both find something they like on Purina Beyond's canned cat food menu. And for kitties that get bored easily, try exciting proteins like pheasant, arctic char, quail, duck, or a trout and catfish combo. From using natural ingredients to extremely selective sourcing, Purina Beyond ensures that what you're feeding your pets is premium quality and nutritionally complete. Going beyond your expectations as a pet parent and exceeding food quality and safety standards is what Purina Beyond is all about.Their expert team of pet nutritionists choose every ingredient and oversee each recipe from beginning to end to create nutrient-rich, highly digestible meals your pet will love. Diabetic senior cat licked the dish clean! My parents cat Chloe was recently diagnosed with diabetes. Because of her age (15) their vet recommended trying to control her condition with food changes. Her first can of the Beyond pate (wild salmon) was a big hit, she literally licked the dish clean and wouldn't let her daughter have a taste. Because these selections are all under 4 carbs, this will be a good option for her. She enjoys the other two flavors also. Fish in any form is not natural to cats despite the fact that cat food companies have been foisting it down cat's throats for years. Cat food should contain red meats and poultry, no grain or vegetables and no artificial ingredients. We have shortened the lifespan of cats for decades. It is time to get it right. This was a great way to try a few different flavors and a different brand for the cats. They loved all three flavors! now I will know what to purchase in larger quantities in the future. My four cats turned their noses up at this one! They left it in the dish BEYOND their feeding area! NO go... they like the Sheba better. 3 male seniors and one young girl. 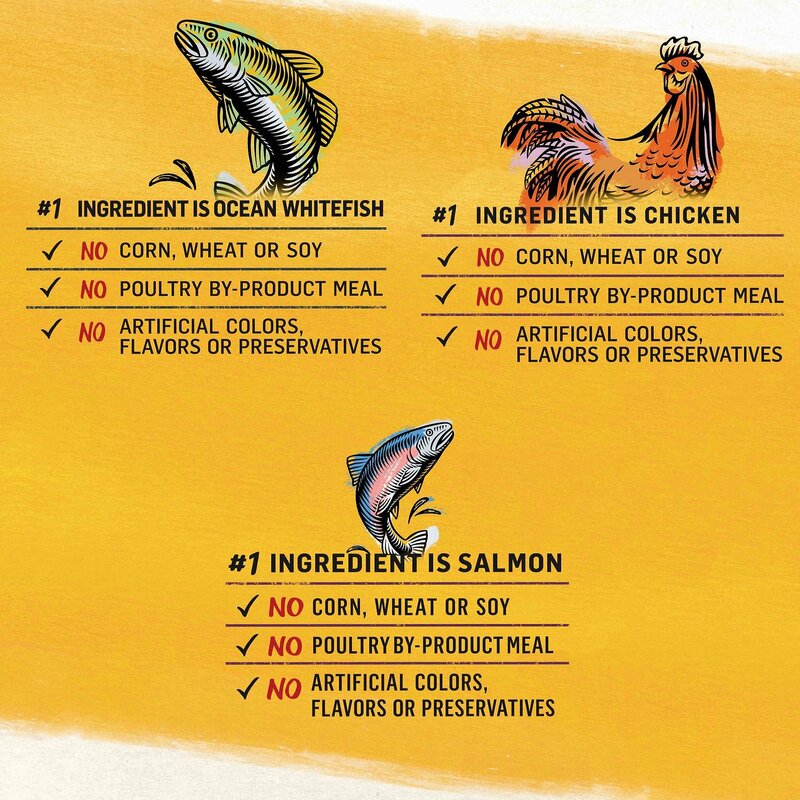 As I said before, my picky eaters , only adored one flavor of this and it was the salmon.. they did not like the trout and catfish, nor did they like the chicken and sweet potato. I'm sure this is a perfectly acceptable food, but both of my cats walked away from 2 of the 3 flavors. Not a good choice for them. Pansy really did not enjoy this at all. I am trying to get her to eat more grain free wet foods. I have tested many brands and flavors over the last couple of years. All my cats liked it and so i will buy it again but won't make it a staple dor them. I'm not a fan of adding things cat don't need in rheir food thats just for the eye of people to buy it. 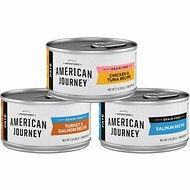 My cats were less eating less wet food so I ordered this assortment in the same brand and it worked. I’ll switch them to this new food flavor and type. Happy kitties.